Once upon a time.....a conceited frog never missed an opportunity to show his friends how different he was, and how much better than everyone else. When folk were jumping he always tried to do the highest jump. when it was a question of diving he was first into the water In other words he had to be tops all the time. 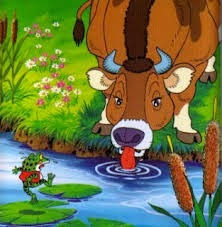 One day a big ox came to drink at the pond. Frightened all the frogs hopped away to hide in the reeds but when the saw that the ox was harmless the came out again to watch the huge beast Isn't he whopping! they exclaimed to each other. One frog then said: It would take hundreds of frog like us to make one of him. Now the conceited frog far more scared than the others had dived into the water at the sight of the ox. But a little later he returned and after listening to his friends remarks he said He's certainly bigger than we are. But he's not enormous! But nobody was paying any attention to the conceited frog. so he raised his voice...and puffing out his chest, announced: I could easily become as big as that ox! Look! The frogs began to smirk. You're very little far too little! But the frog just blew himself out even more. Now look he whispered as he tried not to lose air. His friends giggled. What about now? he managed to gasp as he blew some more. The ox is much bigger came the reply. The breath he frog made a last great effort taking an extra deep breath he blew himself up until...BANG! His skin burst! The astonished frogs saw their friend disappear from sight! for nothing was left of the conceited frog but scraps of green skin. The ox, who had raised his head when he heard the bang, went beck to his drinking and the frogs hopped away, remarking: ''It doesn't do to become too swollen-headed.